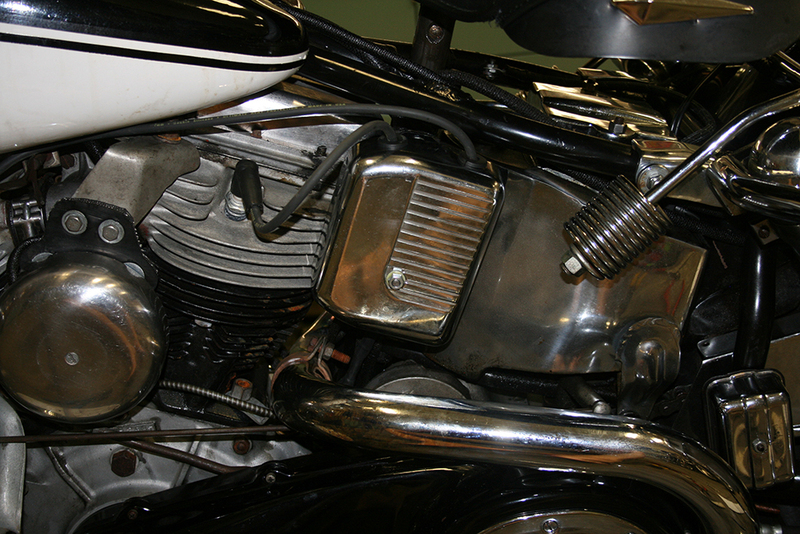 One common upgrade for motorcycles from the 1960′s and earlier is to change the electrical system over from 6 volts to 12 volts. 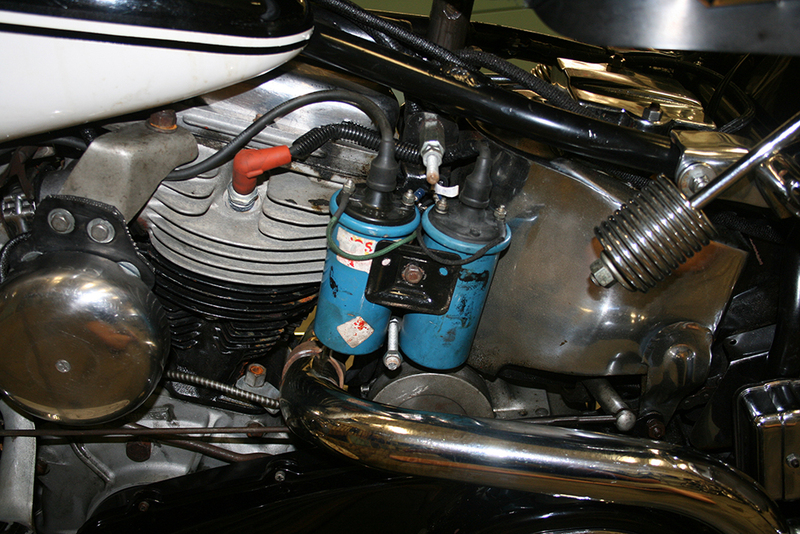 When I purchased my 1964 Duo-Glide, the original owner had already made this conversion, but had used a set of 12 volt ignition coils from a Volkswagen. This arrangement worked fine, but the larger coils needed a “custom” oversized cover to hide them from view. 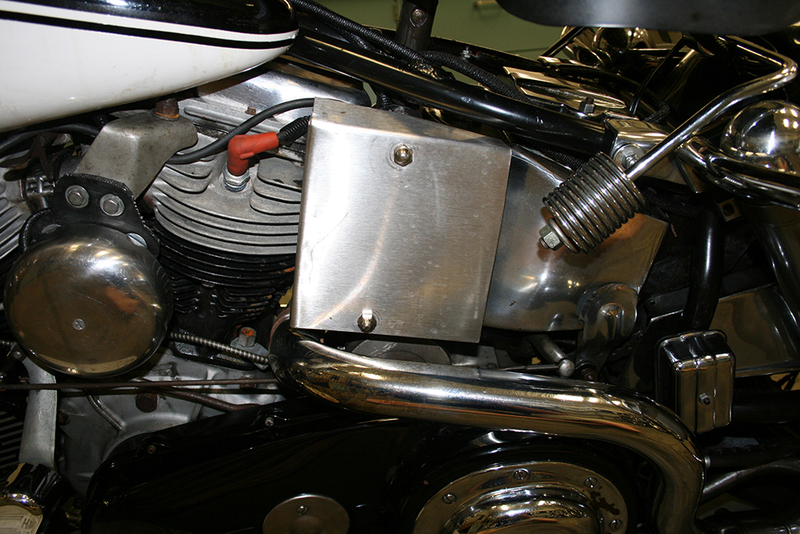 In keeping with my goal of creating a motorcycle that retained as many correct parts as possible, yet was a reliable rider, I decided to try and install the correct coil cover. I purchased an OEM cover on eBay and then started hunting for the right size coils to fit under it. 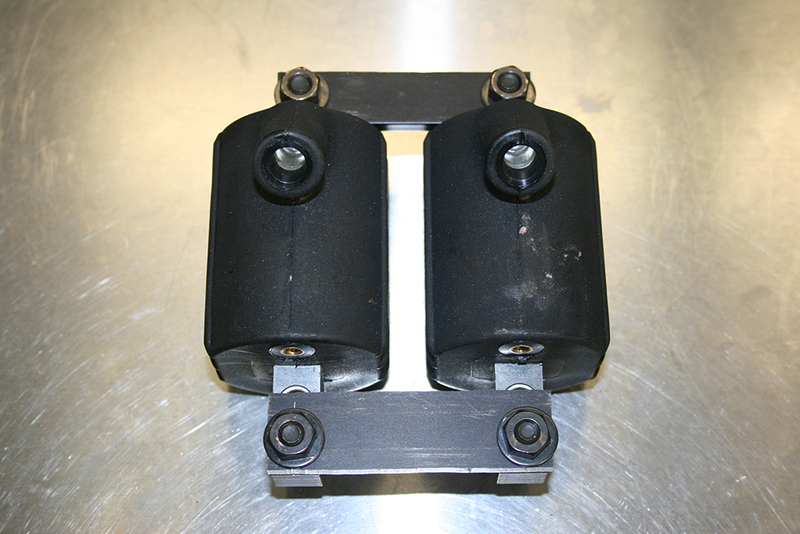 The original 6 volt coils were 4″ high and 2″ in diameter and looked very much like a miniature version of the 12 volt coils used on most cars in the 70′s and 80′s. I searched the web for part numbers for a correctly sized replacement, but information on this upgrade seemed to be non-existent. Next I decided to give Bosch a call, figuring they could just look up what I needed in their vast selection of ignition coils. This turned out to be a waste of time, because they could only search for coils based on the make and model of a vehicle. A couple more calls to Bosch Racing and some of their distributors also yielded nothing, so I contacted Dynatek. Dynatek did not have a coil that was the same profile as the original 6 volt unit, but they did make a pair of compact 12 volt coils with 5 ohm resistance that would work with my dual circuit breaker ignition. 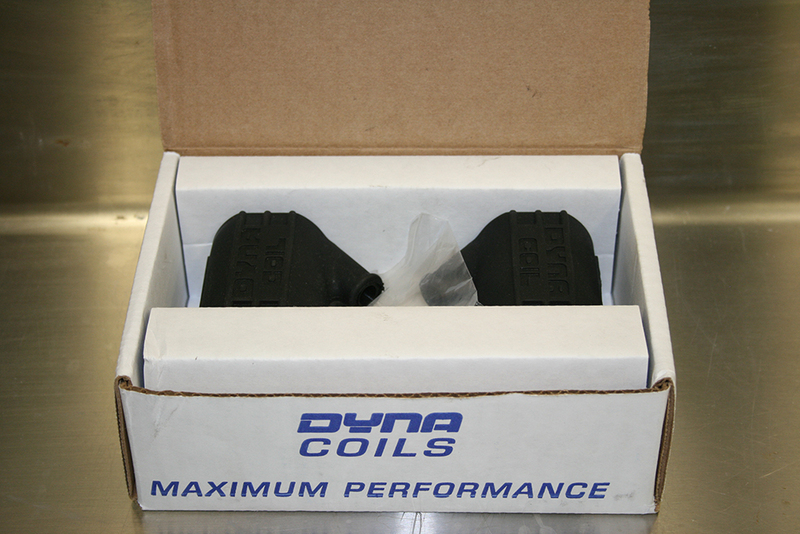 Realizing that this was probably my best option, I decided to take a chance and ordered the Dyna DC10-1 coil set. Once the new Dyna coils arrived, I removed the “custom” coil cover, the old blue coils and the coil bracket from my motorcycle. I played around with positioning of the new coils until a found a way to mount them which would allow the stock cover to be used. 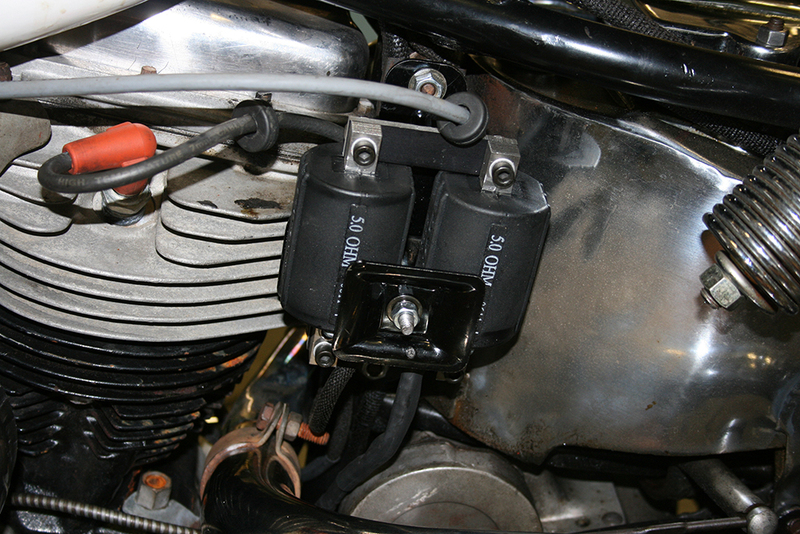 Basically, I positioned the coils using the original mounting bracket, but with the spark plug wires exiting behind the bracket. 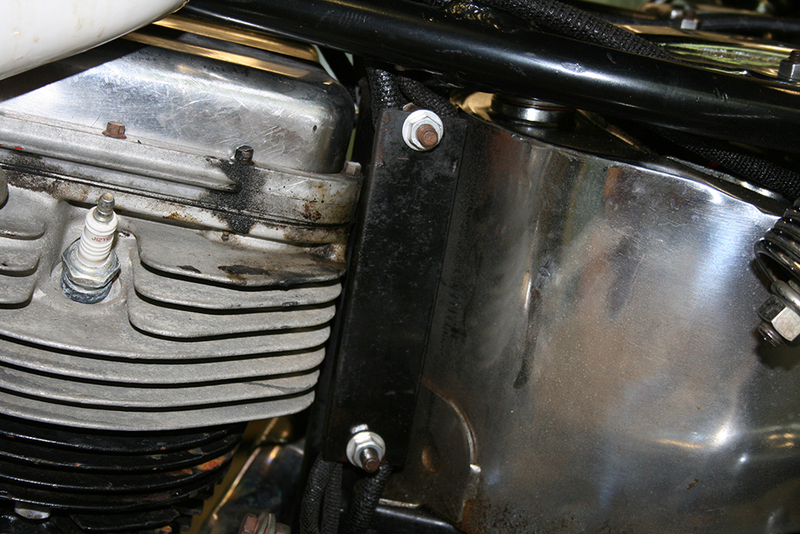 Since the front spark plug wire exited very close to the rear cylinder and the rear spark plug wire exited very close to the oil tank, I added a nut and washer to the mounting studs of the coil mount to space it out ~1/4″ from the motorcycle. With the mounting complete, I rewired the ground and power connections, attaching them to the coils with the included ring terminals. I soldered these connections which should help them stand up to vibrations better than just crimping on the terminals. The final step was to cut two custom length spark plug wires. A quick tip on making custom spark plug wires is to check with your local auto parts retailer. In my case I stopped by Autozone and picked out two of the longest single spark plug wires which had the correct ends for my application. The cost per wire was only $5.99. When I got home, I carefully removed the terminal from one end of the spark plug wire, cut it to the length and crimped the terminal back on. 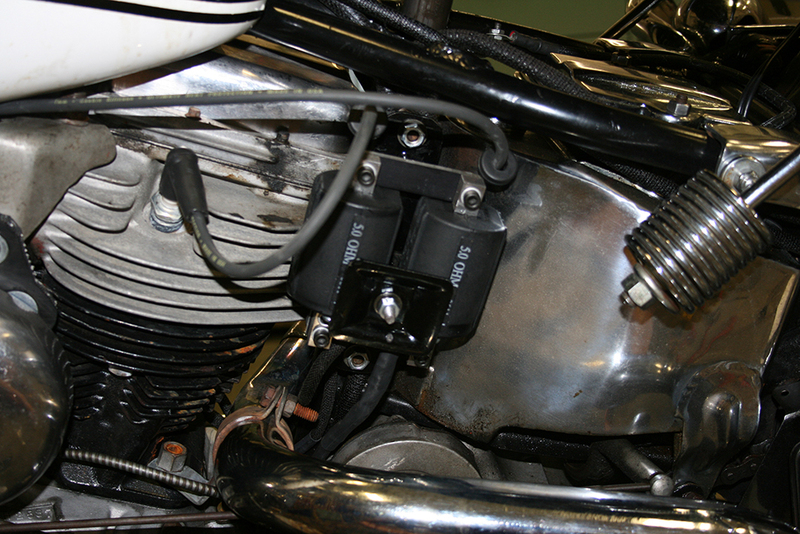 The final touch was to install the correct coil cover and fasten it in place. Now that is 12v did she run any better? I have a 1963 6v with a single point breaker. It runs well but with the loss spark it backfires. I dont mind the 6v system but I was going to convert back to the dual coil setup, I have the dual breaker and coil, any pointers I could use, flywheel timing window etc? Thanks for posting this... I've wanted to use the stock coil cover and breaker on my 12v 64, but had not run across anyone with a decent solution until now. I was also looking at the the dc10s, but didn't know their dimensions. Looks like its time to buy a pair of these. Thanks again.